A self-educated engineer and naturalist, Increase Lapham was Wisconsin's first scientist and one of the state's foremost citizens. He wrote the first book published in Wisconsin; made the first accurate map of the state; investigated Wisconsin's effigy mounds, native trees and grasses, climatic patterns and geology; and helped found many of the schools, colleges and other cultural institutions, including the Wisconsin Historical Society, that still enrich the state today. He also kept in-touch with many of the leading geologists, botanists and other scientists and artists of his day, amassing an album of photographs to visually complement his extensive personal correspondence. Lapham's album of portraits, 95 in all, is a feature gallery from the Society's visual images collection. Lapham was born in Palmyra, New York, in 1811 and came west to Milwaukee in 1836 to assist with the construction of the Milwaukee and Rock River Canal. The canal was never built but Lapham decided to stay in Wisconsin, helping his new hometown grow from a village to a booming city. Appointed deputy surveyor for Wisconsin Territory, Lapham surveyed city plots, registered land claims and drew the basic plat of the city. In 1836, he published Wisconsin's first scientific imprint, a "Catalogue of Plants and Shells Found in the Vicinity of Milwaukee." His "Geographical and Topographical Description of Wisconsin", published in 1844, became the first commercially printed book in Milwaukee and proved popular with immigrants seeking information about their new home. Among his approximately 80 publications, the two most important were The Antiquities of Wisconsin (1855), which focused attention on the state's Indian mounds, and On the Disastrous Effects of the Destruction of Forest Trees, Now Going on So Rapidly in the State of Wisconsin (1876), a pioneering work in the field of forest conservation. 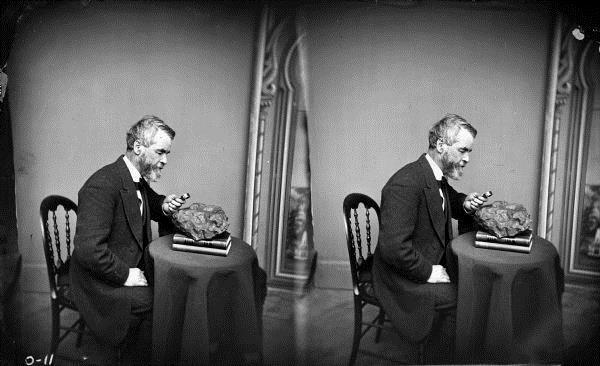 Like other scientists of his time, Lapham shared plants, fossils, rocks, meteorological observations and fish through the mail. 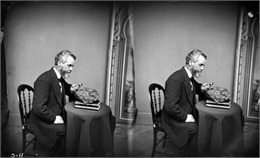 It was through this practice that Lapham acquired these photographs. The ninety-five portraits within this gallery portray acquaintances of pioneering Wisconsin scientist and antiquarian Increase Allan Lapham (1811-1875). All are from an album of cartes-de-visite photographic portraits collected from 1862-75 and depict many notable 19th century geologists and botanists-and a handful of authors and artists-from America and Europe. This album functions as a photographic component to the Wisconsin Historical Society's expansive Increase Allan Lapham Papers, 1825-1930. More than merely helping put a face to a name, however, it adds rich and personal complexities to its enormous textual counterpart. As such, these photographs may be used as a primary resource in their own right to better understand Lapham's 19th Century world. I found my first fossils and began my collection. The beautiful specimens I found in the deep rock cut at this place gave me my first ideas of mineralogy and initiated a habit of observation which has continued through all my life. Of seemingly equal significance is how this passage illuminates Lapham's affinity for collecting and sorting things them into taxonomical categories, whether it be rocks, plants, or-in this case-photographs. Perhaps this character trait is unsurprising, however, as 19th Century botanists or geologists share a closer resemblance to today's collector-albeit an astute one-than today's scientist. 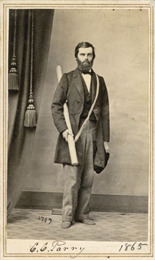 Lapham, along with his colleagues, amassed extensive herbariums and catalogues containing countless regional plant specimens, often acquired by post rather than in the field. This constituted Lapham's relationship with many of these figures; quite a few he may never have met in person. It would be inaccurate, however, to credit this album entirely to Lapham's obsessive collecting habits. Trading cartes-de-visites was an immensely popular activity during this period, and many people had albums of this sort. What's more, the album was not his direct undertaking, but rather a project of his two daughters Julia and Mary. In numerous letters within the Lapham collection at WHS, Mary or Julia offer a cartes of their father in exchange for one of his colleagues'. More frequently, however, Lapham himself would request a portrait on behalf of his daughters, often amidst more scholarly discussions of mosses or lichens. But even this practice was not specific to Lapham. Botanist John Torrey, confessed in a 1865 letter, "Requests for photographs have been neglected more than other letters, because I had none that my daughter wants consent to be given away," and later added that "…I, too, have an album for botanists, and would be pleased to have his to place in it." 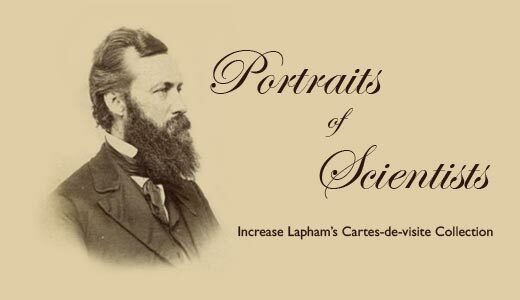 Nonetheless, considering the size of this album, as well as the prominence of the scientists featured within it (it is nearly a who's who of 19th century scientific world), it remains a strong testament to Lapham's scope as a public figure. Read a biography of "Wisconsin's First Scientist" Increase Lapham, from his early life and work to important scientific, civic and educational work in Wisconsin. View "Increase Allen Lapham, First Scholar of Wisconsin"